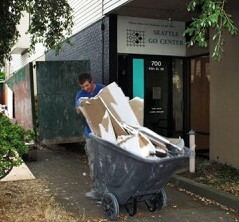 The new tenant at the Seattle Go Center has begun renovations by taking out some old walls. The recent work has pleased the Board and staff of the Seattle Go Center. “We are happy to see that Companion Pet Clinic is on schedule to open this fall” reports manager Brian Allen. The long term lease with the veterinarians will be a big help to the Go Center budget. Rent payments begin in December; the downstairs was empty for over a year.